Recently we talked about troubleshooting Wireless Network and fix any issues with network connectivity on your home or office wireless connection. This article provides all possible methods to fix Wi-Fi Connection Issues. There are some items like Wi-Fi keeps disconnecting, no Internet connectivity, etc. They all can be fixed by trying these general tips. Before we get started there are lots of things you will need to take care. First, check if your Internet Service Provider is working or not. Sometimes users forgot to pay bills, or because of technical difficulties there can be issues while accessing the Internet over your Wi-Fi network. Also, check cables and all signals are all right, and you are connected to your ISP's network. Restarting The Router :- Sometimes restarting router can do the trick, you can quickly reset router from it's setting interface but turning off router from the switch for 1 minute is what every tech support guy will suggest you. If this doesn't solve your problem, read ahead. Remove and Re-Add :- If there is any issue with Wireless Network profile then you can delete and readd it. In open Control Panel > “Network and Sharing Centre,” select “Manage wireless networks”. Right click on Wireless Network's name and click on "Remove Network" and find your wireless profile again and configure it from the start. Check Power Plans :- In Laptops your power plan might be restricting wireless adapter to reduce energy usage. This can be fixed. Open your power plan setting and change advanced power plan setting. 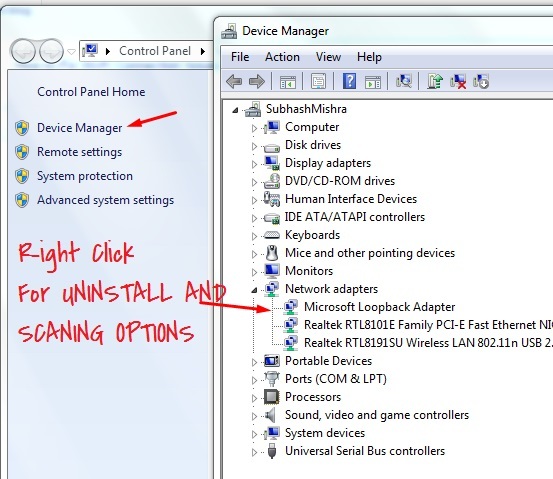 Reinstall Wireless Adapter Driver :- If you are not using a right driver for your wireless adapter then it might create an issue. So find and install the correct driver (use 3dpchip). In case you already have the right driver for your network adapter, reinstall the driver. Go to Computer Properties > Device Manager > Choose your Network adapter and uninstall the driver for this hardware. Once the driver is uninstalled rescan for hardware changes by clicking on any of hardware item in the list. Driver for your wireless adapter will be scanned instantly. All of the above methods are helpful to fix Wi-Fi Connection issues. In case if you are facing some random or unique issue or problem you can not do anything about do let us know in comments. Soon we will be publishing more blog posts about Wireless networks and solution for the various Wi-Fi issue; you can follow us on Twitter and Facebook.